Vinyl banners are a great way to grab many people's attention at once, but where they are displayed makes a huge difference. If placed outside on a bright sunny day, custom banners with a gloss finish may not be the best option because they will reflect the sun's rays, thus making it harder for prospective customers to see the vibrant colors and inviting message. In these situations, businesses should consider custom vinyl banner printing online for their matte banners! Without the shiny coating on top of the custom banner, onlookers will be able to read the information on the banner with ease. At BannerBuzz, our custom vinyl banner printing techniques will ensure that each banner will still drive traffic toward your storefront because the signage will be easy on the eyes and reader-friendly. Use our custom vinyl banner printing online and remove the glossy glare for a trade show. Many of these showrooms are full of fluorescent lights, which can be a vinyl banner's enemy if it has a semi-gloss finish. Businesses show up to these events to network with colleagues and potential clients, and the only way they are noticed is if people can read the banner. Those using our matte banners can extend their shelf life through proper care of the product. 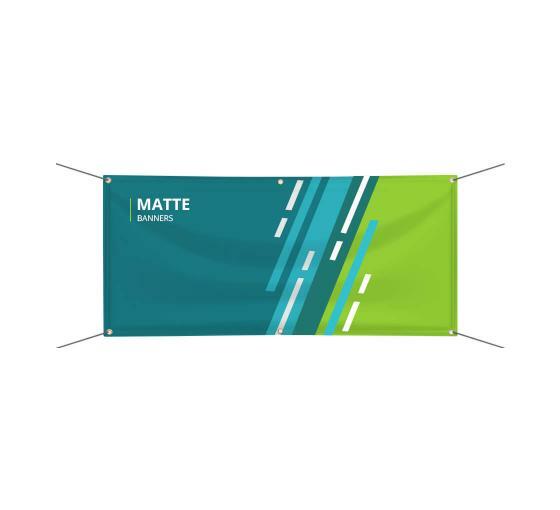 Because matte banners lack the gloss finish, they might not be as weather-resistant. However, experience our banner printing online and you'll see that they are still tear-resistant and strong enough to withstand many weather conditions. At BannerBuzz we have a gallery of banners for customers to choose from. Those who have their own images can import them into our web application and begin designing the banner that suits your business' needs. With custom vinyl banner printing online, every customer is qualified for one free art proof before the print is sent off to our printing team.